In the late 1980's, shortly after funds were appropriated for the Florida State Fire College, Fire Chief John Wright, now retired from the Deland Fire Department, proposed that a memorial be erected at the Fire College dedicated to those firefighters who had made the supreme sacrifice while serving the State of Florida. Within two years, over $50,000 had been collected from donors who came from all walks of life, including career and volunteer firefighters of every rank, civilians and fire service organizations. Virtually every firefighter in Florida contributed to the memorial fund. Artist Don Murray of Gainesville, Florida, whose father was a firefighter, was commissioned to create the statue that has become the focal point of the Florida Fallen Firefighter Memorial. The life-size bronze statue of a firefighter does not depict the typical heroic pose we often see, but is instead modeled in a pose keeping with the purpose of the Memorial, that being a "Firefighter at Rest". The base of the Memorial was designed by Florida State Fire College Staff, and was constructed by them with assistance from professional masons. 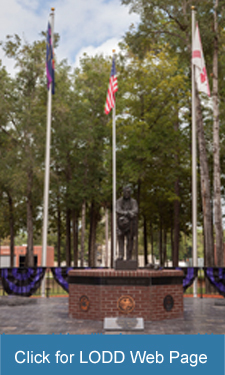 The Florida Fallen Firefighter Memorial was dedicated on January 11, 1992, and occupies a place of honor at the center of the Florida State Fire College Campus in Ocala, Florida. The Florida Joint Council of Fire and Emergency Services and the staff of the Florida State Fire College maintain the Memorial in perpetuity. While visiting the Florida Fallen Firefighter Memorial, please remember that this small piece of earth is dedicated to the memory of those who have given their lives so that others might live! Approved by a Florida Cabinet Resolution on April 13, 2004, the Florida Fallen Firefighter Wall of Honor includes a handmade bronze statue of two firefighters accompanied by bronze plaques which display the names of the fallen heroes. The Wall is located on the plaza level of the Capitol, adjacent to the entrance to the Chief Finance Officer/State Fire Marshal's office. The Wall of Honor's location in the Capitol means that countless Floridians and visitors will have the opportunity to reflect on the meaning of the sacrifices these firefighters have made! Florida Firefighters who die in the performance of their duties, and firefighters from outside the State of Florida who die in the performance of their duties within the borders of the State of Florida shall be honored in recognition of their sacrifice. This honor includes having their name inscribed on the Florida Fallen Firefighter Memorial, located at the Florida State Fire College in Ocala, and on the Florida Firefighter Wall of Honor, located in the Florida State Capital in Tallahassee. (a) Deaths that are the direct and proximate result of an injury or exposure sustained en route to, during operations at, or returning from the scene of an emergency incident or during a training activity. (b) Deaths from heart attacks or illnesses directly attributable to a specific emergency incident or a training activity. (c) If the firefighter was performing his duties in a grossly negligent manner at the time of his or her death or catastrophic injury.